While refilling the backyard feeders, I heard loud drumming above me in the tree. 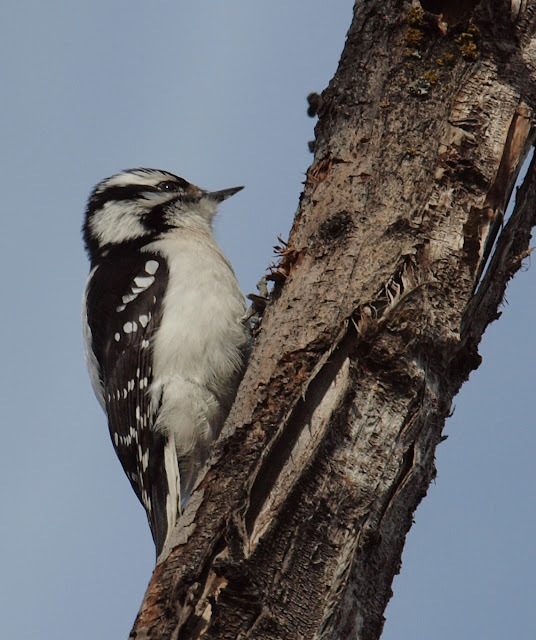 It took me a few minutes wandering around the base of the tree looking up and getting a nice neck cramp and making the neighbors sure of my absolute lunacy, but I did eventually find that female Downy Woodpecker perched on a dead split branch. She wasn't eating, just drumming away. "Why was she drumming?" I asked myself. Was she signaling her readiness to mate? Was she establishing her territory? There has been a second female hanging around recently, but not today. Perhaps she lost out to this little drummer. She was certainly communicating something 'cause while else would she be bangin' her head on a dead stick. While looking at this little drummer gal I noticed several hollows in my tree that I had never noticed before. Well, I'll be! I've got a dozen natural and bird-made cavities in my tree, perfect spots for Woodpeckers, Owls, Kestrels, and of course Starlings. She really enjoys the suet feeder and I find her there several times a day. She never lets me get real close for photos, so these shots are the closest yet. As I approach, she tends to zoom up the tree, on the backside of course, occasionally peering around to see if I am still there and then goes up a few more feet. Once at the thinner branches she flies off to the larger tree. Later, I watched her flitting around the branches chasing live insects. She stealthily approaches the bug and in an instant snatches it from the bark. Sometimes the bug flies and she follows it with her eyes and gives chase once the bug lands on another branch. I never see her fly-catching on the wing. Other times she pecks at the bark digging for burrowed-in bugs and larvae as one would expect a woodpecker to do. This evening I had my 6 year old daughter Victoria with me observing the dainty Downy. We talked about how she used her tail to prop herself up against the tree trunk and we looked at her color pattern, where the white was and where the black was. The white spots on the wings and the white patch on the back. The black and white stripes on the face. We saw her pounding her hard bill on a branch looking for food. When I uploaded the photos, I was delighted to find this one showing the long pink tongue. I recall a diagram showing how a woodpeckers tongue wraps up inside its skull. It's feet are pretty cool too. Sometimes backyard birding, actually watching and observing behavior, can be just as fulfilling and perhaps more interesting as a trip to a new location racking up lifers. Great way to share birding with your daughter. Love that tongue shot! 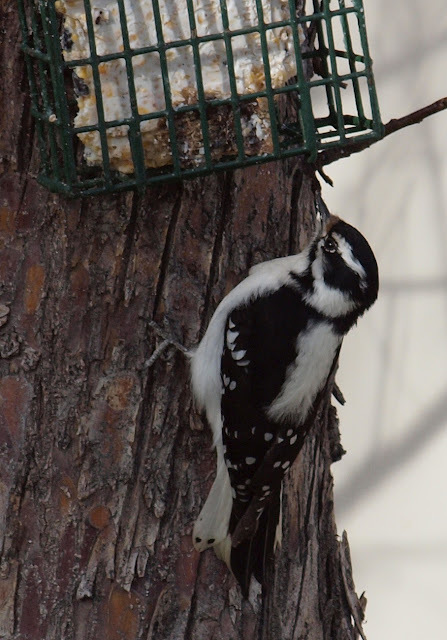 Good shots of the Downy Woodpecker. I wondered too, why they were pecking, so I searched and found the following article by a biologist. @dAwN - every once in a while my kids actually enjoy learning about birds so I have to take advantage of it when they are in the learning mood. @Kelly - aren't woodpecker tongues amazing?! @MikeyBoy50 - Thanks for link Mikey. It confirms what I had thought. Great post! I'm noticing these little ones all over the place this year. Sometimes they are easy to miss. Love the tongue. Great post. I have one Downy and one Hairy at my feeders right now. Great comparison. How did you manage to get her tong? ;-) Beautiful shots of this nice downy!! Backyard birding with a little beauty like that woodpecker is definitely fun and interesting. Thanks for sharing. lovely shots...visiting from bird photography...followed you, hope you'll follow me back..
@Mike B. 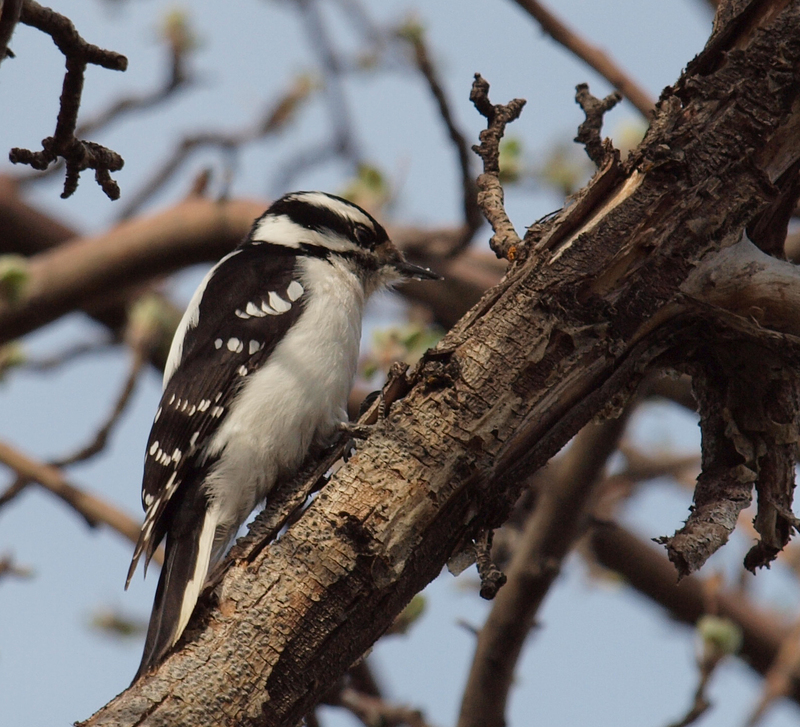 - I have read that the Downy Woodpecker is the most abundant woodpecker in all of North America. I would have thought the Northern Flicker was, but Downy's do seem to be all over the place. @NatureFootstep - Thanks for the nice comment! @Bill S. - You know, I just don't see Hairy Woodpeckers all that often. I have a dream photo in mind of a Downy on one side of the trunk and a Hairy exactly opposite, or one above the other, but a shot to show the comparison between the two. 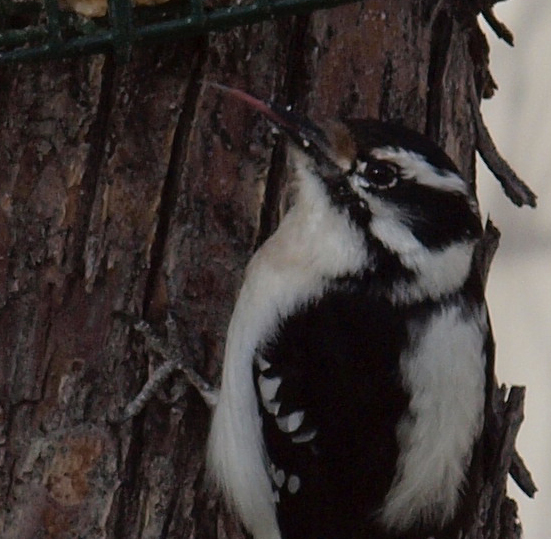 I guess photoshop will have to do once I get a Hairy Woodpecker photo. @Chris - the tongue capture was simply pure luck and shooting several frames. @Mick - Yep, even backyard birds can be interesting if you take the time to watch them and listen. Birds always do weird things and its fun to try and make sense of it. @Ai KaiRui Liu - Thanks for visiting Birding is Fun! Looks like you have some fascinating birds in your part of the world. We had a woodpecker living in our roof for ages, we didn't realise but we did keep hearing a strange knocking sound coming from up there that we thought was the old pipes shaking. Sweet Downy and love the tongue shot. I've got some of a Hairy sticking its tongue out and also of some hummingbirds doing that. Interesting. I'd like to get a Pileated with its tongue out.Now THAT would be a shot! @Dylan - Woodpeckers do seem to like the loudest noise possible to establish their territory or let others know they are ready to breed - your roof space must have made for a good drum! @Robin - I too would love to see a Pileated tongue shot. Beautiful shots of the little Downy drummer girl Robert! That tongue shot is definitely a winner! I totally agree that watching bird's behavior, especially in your own backyard, is as good as it gets. Making your backyard attractive to birds with landscaping and feeders goes along way to make that possible and your kids get to learn about nature as you go! Robert, I so agree! What a cute bird! These are great shots and how wonderful to share it all with your daughter!